Creator : McLellan, Alan A.S. This item is reproduced courtesy of the Transcontinental newspaper. It may be printed or saved for personal research or study. Use for any other purpose requires written permission from Transcontinental newspaper and the State Library of South Australia. To request approval, complete the Permission to publish form. The State Library has endeavoured to identify and contact descendants of Thelma and Alan McLellan who may be copyright holders of this material. Where the copyright owner has not been able to be traced, or where the permission is still being sought, the Library has decided in good faith to proceed with digitisation and publication. The State Library invites persons who believe they are copyright owners to contact Library staff to discuss usage of this item. 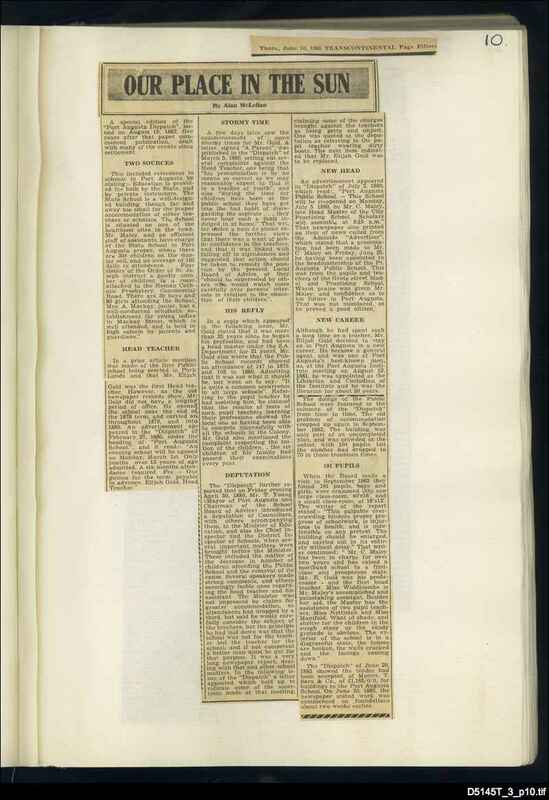 'Transcontinental' historical articles relating to Port Augusta and district collated by A.A.S. McLellan, comprising newspaper cuttings and manuscript additions, for the column 'Our place in the sun'. Includes 'The story of police in Port Augusta: from earliest days'. Alan McLellan was the unofficial historian and archivist of Port Augusta. He came to Port Augusta in 1924 as branch manager of the Adelaide Steamship Company, a job which he maintained until he retired in 1960. From 1961 through to 1967 Mr McLellan wrote a series of historic articles titled 'Our place in the sun' which were published in the Transcontinental newspaper. Alan McLellan cut out and collected the articles as they were published in the Transcontinental, making annotations and corrections to the printed versions. Mr McLellan's columns include topics such as: horse racing, hotels, coastal shipping, local personalities, events and places.